Should an employee who has previously left your employment during the current or previous tax year return, the employee's previous record can be seamlessly copied and completed accordingly. Click the button Leaver Rejoining? Former employees from this year and last year which the software detects a record for will be displayed on screen. Simply double click on the employee record you wish to copy. The new employee record will now be created. Simply complete each screen accordingly with any additional information required. When the new record is complete, click Update to save the employee record. The new employee record will now be added to your listing of employees. A facility is also built into the Leaver Rejoining utility to add leavers from another company. 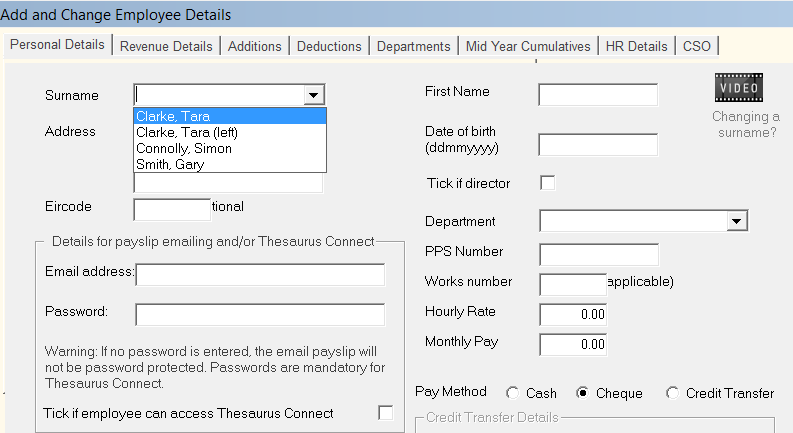 This is particularly useful if you have ceased employees under one PAYE number and now need to add the same employees to a new company setup within Thesaurus Payroll Manager. All the employees who you made leavers in your previous company will be listed on screen. 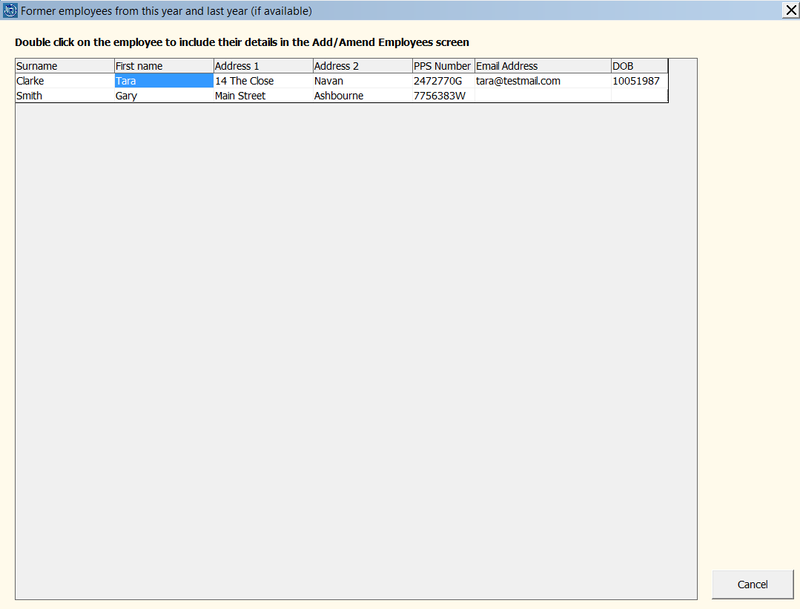 2) Double click on the first employee in the list - a new employee record will now be created for them. Simply complete each screen accordingly with any additional information required e.g. additions, deductions, HR Details etc. 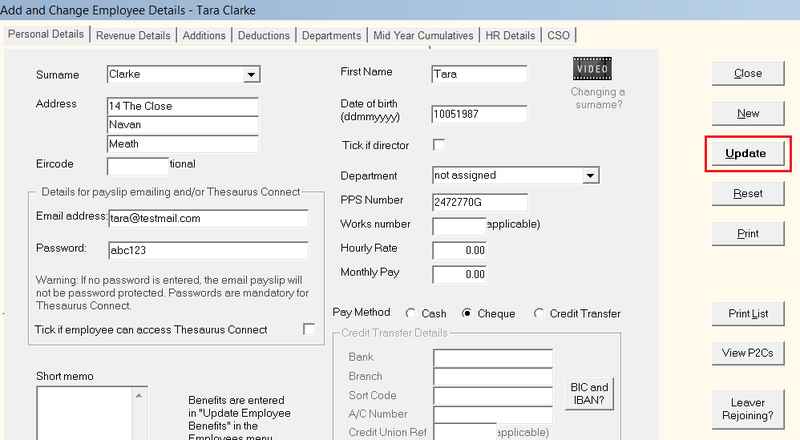 The employee's start date will automatically be entered as 1st January 2019 within their Revenue Details screen. Amend accordingly, if a different start date applies. 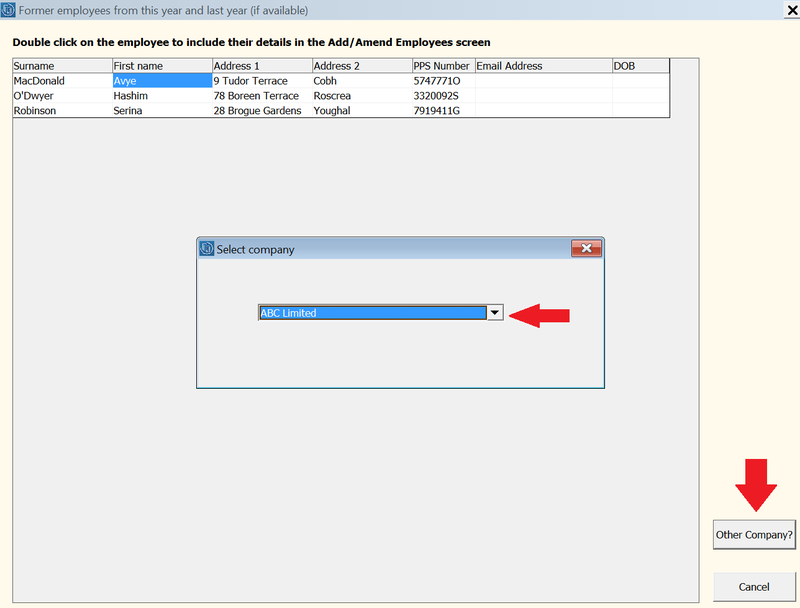 As a default, employees added to the software in this manner will have their PRSI class set to A1 which can subsequently be changed for each employee as required. 3) When the new record is complete, click Update to save the employee record. 4) Repeat the same steps again to create new employee records for all subsequent employees. a) Under PAYE Modernisation, employees will initially be placed on emergency basis until they are updated by a Revenue Payroll Notification (RPN). Therefore when accessing your employees' Revenue Details utility, this will be brought to your attention. 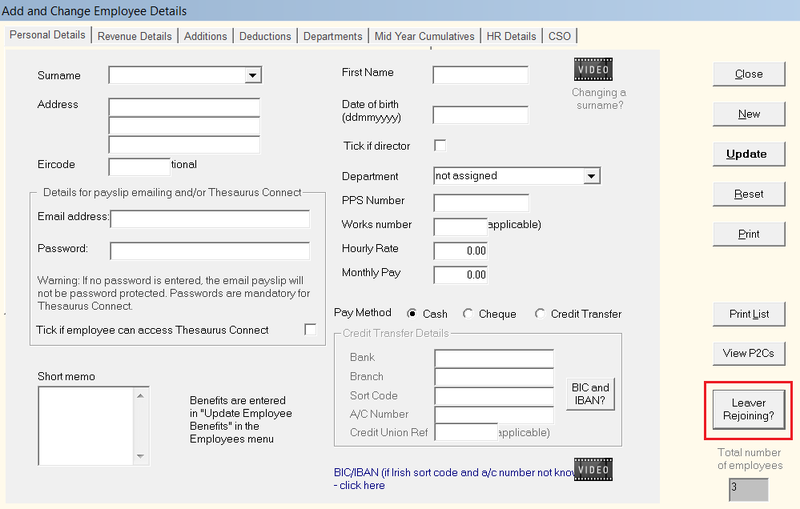 Thus, after setting up all relevant employee records and before processing any payroll, simply access Process Icon No. 2 to obtain the most up-to-date tax credit and cut-off point information for each of your employees. 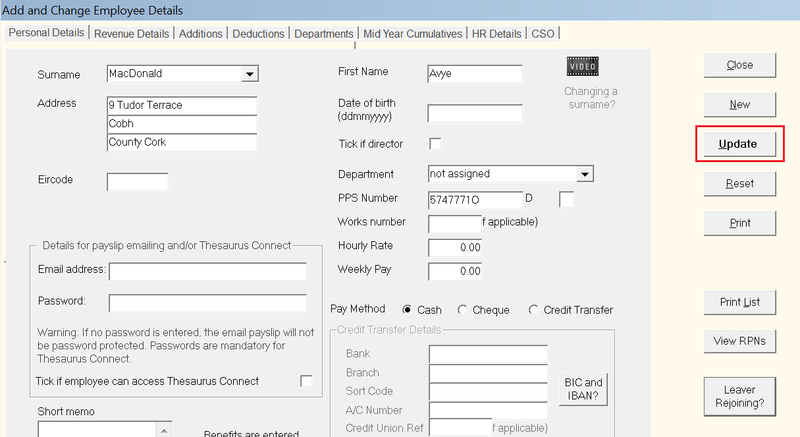 b) After processing the first pay period, each employee's start date under the new PAYE registration number will subsequently be included in the Payroll Submission Request (PSR) that is created for you. Simply submit this to Revenue to inform them of this information.